Music Matters | A blog on music cognition: Do newborns have a language bias? Figure from the discussed paper. Yesterday an intriguing study appeared in Developmental Science of the group of Jacques Mehler. The research is novel in that it provides evidence for the sensitivity in one or two day old newborns for the statistical structure and prosody of speech. What is not novel is that it is a case of labeling a phenomenon as linguistic, while it could have been labelled otherwise – something I have called earlier the ‘language bias’: the linguist’s understandable enthusiasm to interpret many of nature’s phenomena as linguistic (cf. Honing, 2011). With regard to prosody there are equally good, if not better, reasons for referring to the sensitivity to patterns of intonation (melody), stress (dynamics), and rhythm as “musical prosody” or musicality. It is no mere coincidence that these patterns also form the building blocks of music. In human development, this musicality is already active around three months before birth. Not only can infants recognize their mother’s voice and distinguish it from other voices, but they can also remember melodies and, after birth, distinguish them from other melodies that they have not heard before. Both the perception and memory of melody are already functional during pregnancy. Unborn babies appear to listen mostly to the sounds as a whole, with special attention to the intonation contours, rhythmic patterns, and dynamic development of the sound. Only much later, when the babies are about six months old, does this musical prosody begin to play a role in what could be called the beginning of language, such as the recognition of word boundaries (see citations in the introduction of the article in Developmental Science). 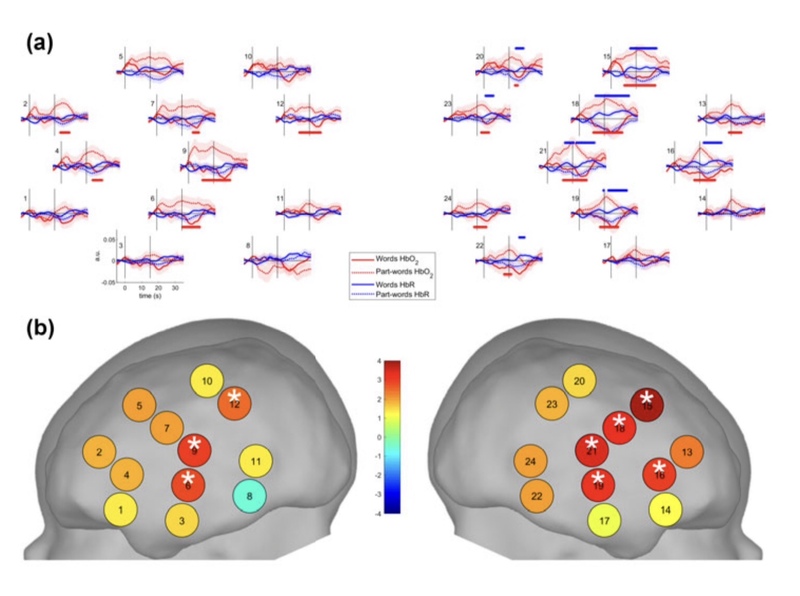 During this phase of development, small tone curves, stress, and specific rhythms help infants to learn their mother tongue (fragment from Honing, 2019:76-77). In part the observations made in the new study sharpen earlier interpretations, especially those with regard to the sensitivity of the statistical structure of speech ((Experiment 1; something that was shown to be difficult to replicate after the first studies of, e.g., Marcus et al.). But with regard to prosody (Experiment 2) there are still other interpretations possible. The big challenge (and a nice one!) is to design and perform an experiment that can disentangle both interpretations. It’s on the research agenda! Honing, H. (2011). The Illiterate Listener: On Music Cognition, Musicality and Methodology. Amsterdam University Press. Honing, H. (2019). The Evolving Animal Orchestra. In Search of What Makes Us Musical. Cambridge, Mass. : The MIT Press.